I love airports. I always wonder what story lay behind the travelers; are they going on vacation; to see loved ones; business? There's always a level of anticipation in the air, regardless of destination, that makes me wonder "Where are they going?" Last evening, as I flew in from my Mom's services in Omaha, I was looking out my seat window. We were pulling up to the terminal and I was anxious to see Tami and Kyle. I observed a lone soldier in desert combat fatigues standing at attention as our airliner came to a stop. Knowing the restrictions on flight tarmac access, I wondered why he was there. As quickly as the question formed in my mind, the answer also came in the form of a deep sadness down in my soul. I recognized it so quickly because I had been living with it in the absence of my mom during my visit. I knew our plane had flown a very special person home. When I reached the top of the skywalk, I heard the gate steward say "Ladies and gentleman, if you would join us in honoring a young man who is coming home." Outside, an honor guard had formed up. Just past them, a family, wearing t-shirts bearing a photo of the fallen soldier, held each other up. His mom and dad looked no older than Tami or I. 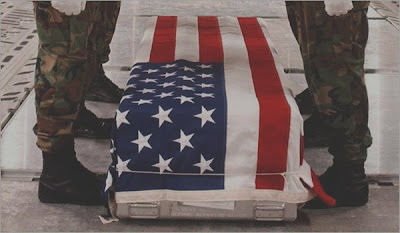 The flag draped casket came down the conveyor belt and into the hands of the soldiers. They were not a true 'dress blue' honor guard. Rather, they were most likely comrades of the young soldier. They smartly escorted their friend to a waiting hearst. Inside the terminal I saw hundreds of people, stopped, paying their respects to this soldier and his family. Many had their heads bowed. Some, who might have been in the military long ago, stood locked at attention- only their bellies to betray their age. Travelers with places to go and people to see, stopped to pay their respects. And then it was over. The airport came to life, and the buzz in the terminal returned. And for once, I knew where a traveler was going. 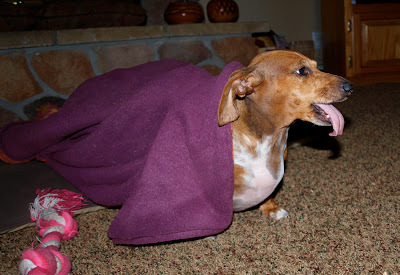 Anyway, photographic evidence now suggests that the evolutionary development of the Weinerdog came about, not so that they could enter into gopher burrows in order to hunt, but so that their tongues could retract in a safe & efficient manner. That's my story and I'm sticking with it. Enjoy your Sunday! And just what is The Wandering Blues? There's nothing better than exploring. New locales, new foods, new ideas. This blog pays homage to those who want to know "What's around the next bend?" Those who believe the best adventure is yet to come! Welcome and enjoy the trip!